It’s been longer than I’d like since my last post, but as you may have read on FB, little Miss S has had a fever for the past three days. I’m doing my best nurse impression. Thankfully she hasn’t had any other symptoms than the high fever…but three days? I have made this once before – it’s so good. I found this recipe after we purchased four pounds of mild Italian sausage from Sam’s Club for the first time. I didn’t have many ways of using that much sausage, and I rarely cooked with it. Since then, I have found a few really good recipes that feature this type, like sausage bread! It’s my family’s favorite and I will be sure to post about it soon. As for the cheese, I recommend not buying the pre-shredded “Italian Cheese Blend” at the store. There is usually corn starch or some other anti-clumping additive in pre-shredded cheeses that leave an unpleasant grainy-ness to the finished cheese sauce. That’s the mistake I made the first time and since then, I don’t buy the bagged cheeses. Thanks for reading! Bring a large pot of water to a boil. Salt water and cook pasta to a chewy al dente, about 8 minutes. In a nonstick skillet, brown and crumble the sausage. Drain cooked crumbles on a paper towel lined plate. Return pan to heat and add extra-virgin olive oil, butter, and garlic. Season with salt and pepper, to taste. Saute about 3 minutes, until garlic is fragrant. Preheat broiler to high heat. Add flour to skillet and stir, cooking 2 minutes. Whisk in stock, then stir in cream. Bring cream to a bubble, then stir in 2 cups of Italian cheese blend. When cheese has melted into sauce, add tomatoes. When sauce comes to a bubble, remove from heat and adjust seasonings, adding hot sauce if desired. 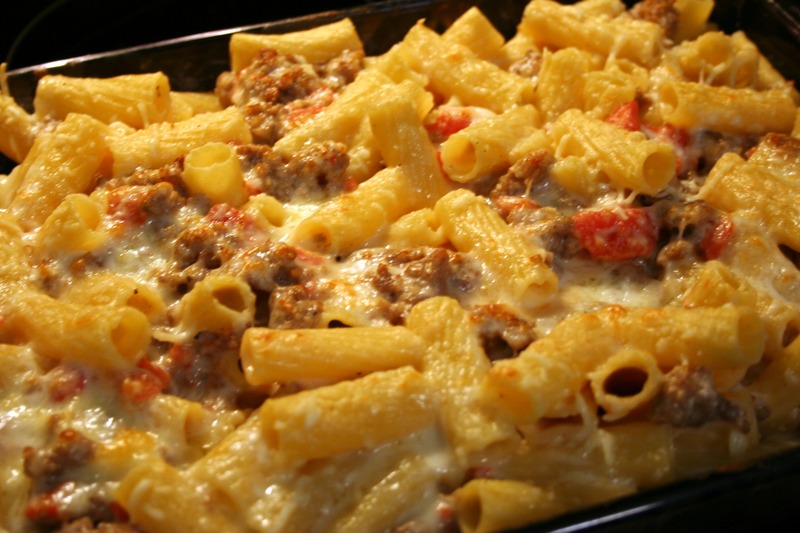 Combine cheese sauce with sausage and pasta and transfer to a large baking dish. Sprinkle with additional half cup Italian cheese blend and grated Parmesan. Cook under hot broiler until cheese is browned and bubbly. That looks heavenly. I usually do a creamy ricotta Italian-style mac and cheese, but now I want to try this! It’s really good and I have a few friends that have tried it and they enjoyed it as well 🙂 I hope you get a chance to make it soon!